Internet TV is becoming a reality and it is now easier and cheaper to broadcast also know as Streaming. It is a good idea to start by asking some questions. There seems to be a confusion between broadcasting and streaming especially for those who are new to the broadcasting industry. The simple answer is that streaming is similar broadcasting and same principals of traditional broadcasting apply to streaming. There are similarities between the two. A good example is cable TV which delivers programmes via radio frequency [RF] signals transmitted through coaxial cables or light pulses fibre-optic cables. Although streaming is a recent development, its roots points it to cable TV. This brings us to IPTV or INTERNET PROTOCOL TELEVISION. I won't go into details because this topic has been covered before in Kitplus magazine but I can list three types of IPTV Video on demand [VOD],Time-shifted IPTV and Live IPTV or IP simulcasting. Given the brief explanation it is easy to see the similarities. The main difference is, streaming sending data via Ethernet cable connected to a telephone line, flexibility and cost. I would like to introduce the kit that I use for live streaming before saying anything else. Back in November 2014 in ISSUE 095, I talked about the kit use in my studio which I call Research Box. I have not bought any new gear since then but I have been developing and researching the idea of shrinking the gear. I like the idea of miniaturization, because of space. The kit listed below can be configured in many ways depending on the task, space and requirements from the client and it can be used with a single camera or multi camera shoot. Storage: G Tech and Seagate portable hard drive. Let me expand on the importance of doing a recce. The first step is to talk to the client or the manager of the venue. This can be done in two ways: a telephone conversation or going to the venue. My opinion is to do both. Talking to the client face to face in the best option. I usually ask the client what he/she is trying to achieve. Requirements vary according to client's needs. For example a client might want the stream to look and sound like a proper TV output. This usually includes interviews in between or during live streaming and also adding tittles to the production. This type of production is not simple and cannot be carried out by one person. Failing to do a recce can lead to so many problems which could compromise live streaming regardless of how good the gear is. What should be avoided is to take it for granted that the equipment would work straight away when plugged in. 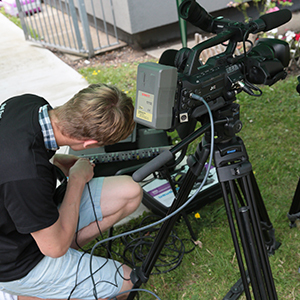 The most challenging aspect of live streaming is to maintain a steady stream of data during the duration of the programme. It is a must to have a robust and fast internet connection, preferably fibre optic. I have tried both Wi-Fi and hard wired methods to stream however I prefer to stream by connecting the encoder directly to the router, using Ethernet cable. I have three cat5 Ethernet cables, 50m 30m and 20m these cables can be joined by RJ45 Coupler Connector and can be configured for short and long distances. There are encoders and various models which are capable maintaining steady streaming using 4/3G dongles, Teradek and LiveU are the most reliable encoders in my experience. Another reason I prefer using hard wired method is to have the encoder connected to a power source, internal batteries do not last long, it is just not possible to stream a two hour programme using internal batteries. There's plenty to talk about live streaming next time I would like to talk about pre production and different kits for streaming. I have written from the experience I have gained and I continue to learn new things as technology is evolving on a regular basis. I hope this information can be use as guide and will help fellow streamers.